There is nothing in this world that makes anything look better than shiny gold highlights around text and generally shiny boxes around huge fonts. What will you draw? Oh uh, three guys on a mountain edge, don’t forget the magic! Fantasy isn’t fantasy without a magic fireball or two. I think the guy at the end is annoyed the others have capes and all he is left with is a male skirt. But what i think has really happened is; they’ve stopped for an excelent photo opportunity (where else do you get excelent scenery AND Pterodactyls? ), and the ledge has started to tilt in proper Italian Job style. Billybob, the dress-wearing warrior has decided to tackle the problem head-on and smash the ledge with his sword. The font and colour scheme are straight from MS office Wordart from about 10 years ago… except with added shiny. I do like the third guy. No weapon, all cape. And could it be the makings of a mullet? 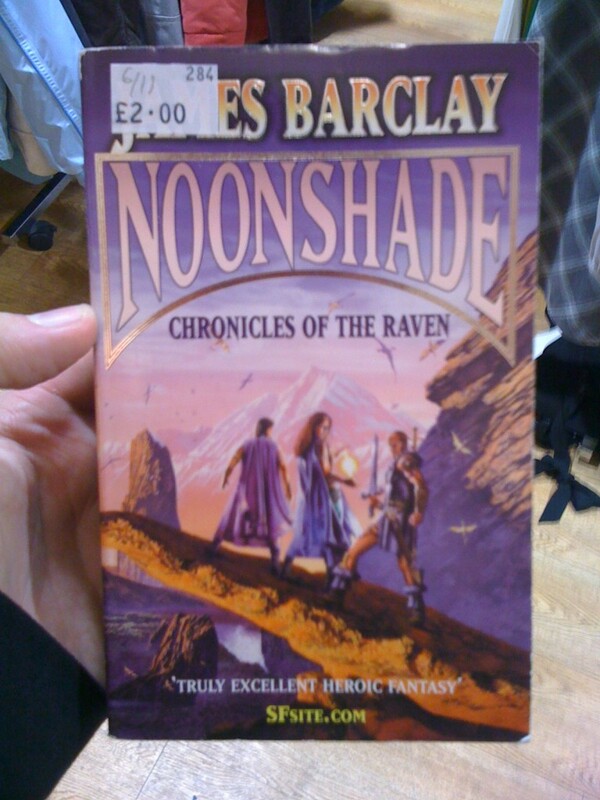 It is missing dragons though but does make up for it with, ‘chronicles of the raven’. Is Fantasy always chronicles of (insert fantasy element here)? I rather like this one, although it does strike me that all three are standing on the gigantic, stony, semi-erect member of some out-of-frame Earth Giant. But maybe that’s just me. James Barclay is a friend of mine, actually. I’m quite temtped to start calling him ‘Â£2.00 E.S. Barclay’ from now on, though. It is indeed a classic fantasy cover. And it is indeed ten years ago. A couple of things. They aren’t pterodactyls, they are dragons so this cover actually misses nothing whatever. Can’t BELIEVE that distinction wasn’t obvious. And I did do ‘Legends of the [insert name here]’ too so not everything is Chronicles. Just nearly everything. I just wish I’d written a passage about the heroes walking along a semi’erect stone giant member. Must get that in another book sometime. Thanks, Adam. What I really want to know is, what have Erienne and The Unknown (for tis them) turned to see that is more interesting than a staggering landscape of mountains and stone giant members and a sky full of dragons? I’m sure James (or anyone whos read it) could confirm that the scene on the cover doesn’t actually take place in the novel. Its a small gripe of mine that fantasy covers in general display scenes that never take place… i may be wrong, but i cant imagine the scene in the book where the trio of heros strike that pose on the edge of a cliff. Is there actual context for the woman to decide summon that fireball and the dude to draw his sword? Its like the Wheel of Time series, brilliant books, but i think the covers are awful (and the covers only vaguely relevant to the story) and that’s probably the reasoning behind their republication in the UK with, in my opinion, better covers. I think Â£2.00 ES Barclay, should be pretty pleased with that name, I’d be more worried if he was 50p ES Barclay. Â£2.00 2nd hand is a pretty decent price! Well as the publisher of this novel (and the man who briefed the cover) all I can say in mitigation is that this was 10 years ago and shiny foil boxes and gold highlights were very much the thing then. And . . . umm . . . it worked; the book sold really well. Oh and I’ll have you know the cover ISN’T missing dragons (cuh!) – the distant pterdactyls are actually VERY distant dragons. I mean, really, it’s obvious isn’t it? Fantastic website btw – have lurked here often before. Couldn’t help myself when Â£2.00es made his debut. He’ll be delighted you know. James, Simon.. Thanks for correcting me on the dragons! As usual I think you can blame the camera I use to take the pictures, and by camera I mean phone. Strangely makes dragons and pterodactyls look very similar! Personally I think they’re standing atop a massive fossilised turd. Possibly left there millennia earlier by a dragon. Every time I look at this I do get an image of wylie coyote. The end of the rock just snapping off and the heros falling. Ending the long drop with a little white cloud of dust. This edition fell into our hands last week after a trip to a second hand book shop. What truely makes it for me is the picture of Barclay on the inside of the back cover. What ever happened to authors putting their pictures on books? Seems to have fallen out of style these days. Having now read it the cover makes more sense. Although I never though of purple cloaks while reading it for some reason. In my mind everyone wears black… all the time. NADS ON HOE: CINCHES LEFT OVER A HORN. Who wrote the “rule book” for fantasy covers, anyway? Who decided which fonts are “Fantasy Fonts”… or how “Fantasy Characters” are supposed to look? Because after having made fun of countless covers, I’m starting to see a pattern. 1. Titles must always be visually overdone. The more embellishments, the more “authentically Fantasy-ish” they look. 2. A title must always be shown as part of a series, or nobody will buy it. 3. Human characters, when shown, must conform to the basic RPG classes: Warrior — Elf — Magician — Dwarf. 4. Characters must be armed with medieval weaponry and/or magical objects. 6. The landscape must never show any signs of cultivation. Readers detest all depictions of farming, gardening and such. 7. Medieval towns, when shown, must be clean and disease-free. Chimneys should not pour smoke, no one has boils, there is never an outbreak of plague or bad teeth. 8. Fantasy characters have always been to the hairdresser five minutes ago. 9. Ugly people must not be shown, unless they belong to inferior races. 10. Neither male nor female characters should be flat-chested.